Galaxies are the birthplace of stars. These universal wombs, ever expansive, churn and glow with pure creative energy. This cloth shows the birth of white and metallic gold stars, the glowing mists of space, and the void of possibilities in between. 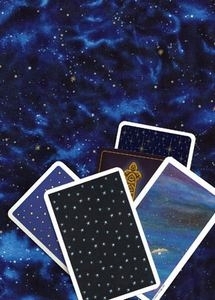 A perfect background for reading tarot cards! It also makes a perfect cloth for an altar or meditation table. 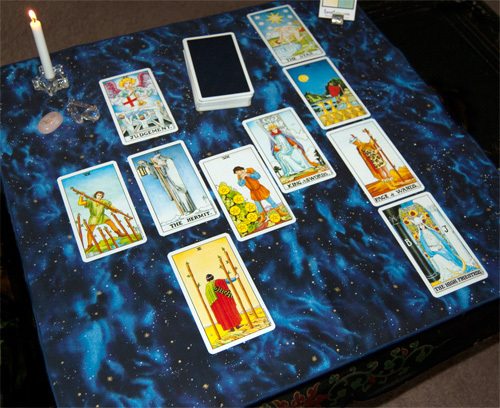 This tarot spread cloth is finished with a navy colored rolled edge hem. Shades of blue, ranging from azure to midnight, make this pattern a fitting match for many decks.